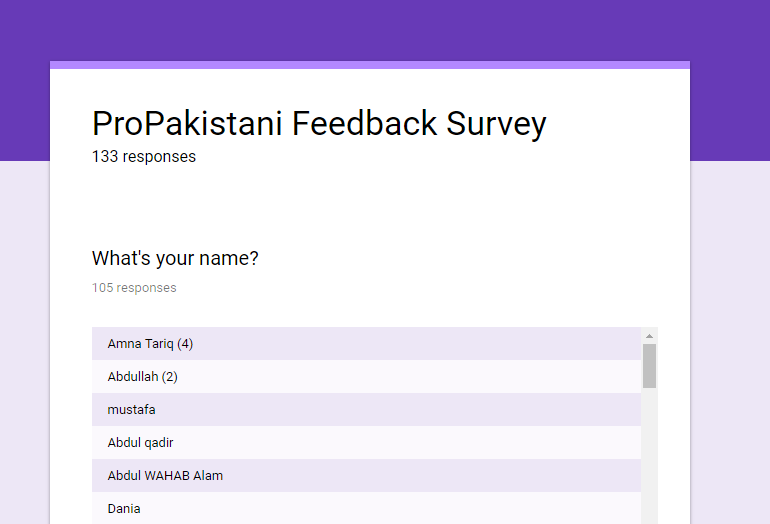 We Need Your Feedback to Make ProPakistani Better! In the past year and a half, we’ve made a lot of changes to the content at ProPakistani. While some have been welcomed, others have drawn vocal opposition. As we approach 2018, let’s keep the conversation going. We want you to let us know what you want to see from us in the coming year. How do you think we can become an even more useful resource? Whether it’s comments on the kind of content you’d like more of, improvements we can make, features we can add or anything else, please spare a couple of minutes and fill out the short survey below. p.s. We heard your feedback on the video ad and you won’t ever see it again. What do you dislike about our content? bhai danda lao.banda mil gaya..
same here warna to comments he read nahi karta tha ! All of the responses are Public? Why? It is the privacy concern, We have shared our e-mails and you have exposed them to everyone….??? Sir data ka masla ni ha, par Publicly to available na kren. Feedback data is always anonymous and kept safe. Not shared publicly, just stats are shared. Our bad, fixed. Thanks for pointing it out. First of all, stop supporting pti from now after. Secondly never post posts for political motives. Third, stop falling for a lot of ads just for money. Fourth, for money please never post like minow, example veon 24mp selfie camera ad post in which you lied to us.